A Feast of Simply Siam! I doubt I can even resist Thai cuisine. It’s a cuisine that I am always lusting after for its signature orchestration of tart and sweet, salty and fiery composition. 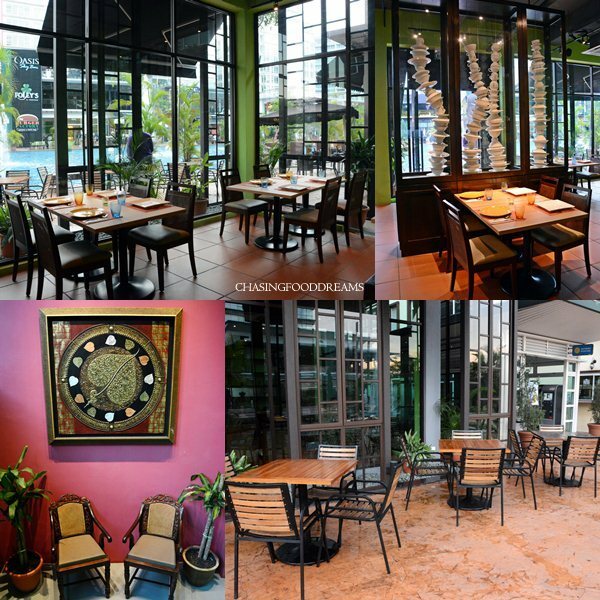 Since I am always on a look out for Thai restaurants, I was happy to discover another one recently named Dé Thai Restaurant located in Oasis Damansara at Ara Damansara. Dé Thai is housed in one of the main shops overlooking the beautiful oasis pool. The whole architecture of the building is designed with the influence of Thai architecture brought up with a modern touch. It is really elegant and stood out among the rest with its solid dark exterior. The interior is designed with minimalist contemporary elegance. The whole ambience has a clean, neat and spacious feel with colors playing from the walls and flooring. Holding fort at the entrance upon entering is a few pieces of topsy- turvy art made with cups and saucers for a playful touch. 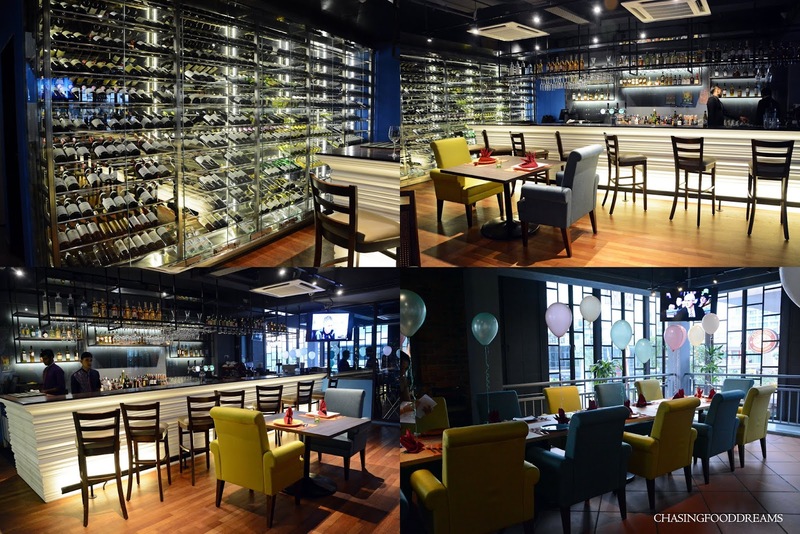 The restaurant has 3 floors of dining rooms, perfect for private functions and events. We headed up to the next floor and were greeted with a beautiful bar and wine cellar. I was told that Dé Thai carries a bold and long list of wines from all over the world. It very cozy, stylish and really suitable to unwind there with friends and family. There are sectioned off private rooms on both levels of dining to offer privacy. Chef Chalocha Daolam or Chef Aew, who hails from Bangkok, is the mastermind behind Dé Thai’s authentic menu served in contemporary style. Chef Aew who is armed with over 30 years of experience lovingly orchestrated the menu which were mainly taken from her own family’s treasure chest, unfolding the yet to be told Thai food history. The menu is filled with many classic Thai dishes and also some fusion ones for the adventurous palates. We unwind the evening with some of Dé Thai house red and white wines while we waited for our dishes to arrive. Dinner commenced with an authentic Thai appetizer of Mieng Kum (RM26). The dish, that is said to be dated back over 200 years, is a favorite of many for those who loves the cuisine. The highlight of the appetizer is the sauce that holds every ingredient together in the betel leaves. A pinch of dried shrimp, raw cubed onion, roasted peanuts, diced lime, diced ginger, toasted coconut, chopped bird eye chili and possibly other ingredients are the platform of every Mieng Kum I know. Simply wrap the ingredients with a nice dollop of the sticky sweet and syrupy sauce and pop the whole thing into your mouth for a burst of flavours and textures. There are two must-have salads in Thai cuisine and Som Tam or Thai Papaya Salad is one of them. Enjoy the raw crunch of pulverized shredded green papaya salad in its pungent spicy garlicky and tangy dressing together with bits of raw long beans, fresh tomatoes, dried shrimp and toasted peanuts. This version is decently yum and even has carrots for added color and texture. I always rate how good a Thai restaurant is with their ever popular Tom Yum soup. The Tom Yam Kung (RM35) here is gorgeous and robust. I can taste the presence of all its ingredients of galangal, kaffir lime, lemongrass, chili, lime, coconut and more harmonizing beautifully. One gets the right balance of sour, spicy, savory with hints of underlying sweetness when enjoying this soup. What made the soup even more luxurious is the choice of having a large sea prawn for extra indulgence! Geang Khiew Waan Kai (RM35) or Green Curry Chicken is another much sought after choice in any Thai meal. Ours was served piping hot in a claypot and filled with chockfull of boneless chicken pieces, round eggplant and Thai baby eggplant and chilies in a very creamy curry sauce. Perhaps it was a tad over creamy hence I didn’t get as much of the intense herb flavours I wanted in a green curry but nevertheless I was still enjoying this happily with rice. Kung Raad Ma-kham (RM85) or Deep Fried Sea Prawn Topped with Tamarind Sauce is a signature of Dé Thai. Large sea prawns are seasoned, lightly battered and fried till golden before it is doused in the restaurant’s signature sweet, sour and sticky tamarind sauce. The sauce has a good balance of flavours with the fresh juicy prawns. It’s a hefty price tag for these crustaceans but if you love large firm sweet prawns then go ahead and indulge! I thought that the dish of Grilled Rack of Lamb with Panang Sauce or Kae Sauce Panang (RM85) was pretty unique. It reminded me of an East meets West dish where in this case, it’s nicely grilled lamb served with the Thai panang sauce on the side. The lamb is tender and superbly juicy. The panang sauce was rich, creamy and mellow for a curry sauce but equally flavourful. The dish was enjoyable because the lamb racks were tasty and tender. The Og Ped Ma-kham (RM40) or Grilled Duck Breast with Tamarind Sauce is also a favorite of mine that evening. Sliced of duck breast with a smoky note are doused in the restaurant’s signature tamarind sauce again and this pairing is gorgeous. The dish is further enhanced by fragrant fried basil leaves and fried shallots with some blanched greens beneath the duck. A must order! Most of the time, I would always order this classic dish of Pla Krapong Nung Ma-Naaw (RM85) or Steamed Whole Sea Bass with Lime & Garlic Sauce whenever I savor Thai cuisine. It is simply a classic dish that represents Thai flavours in every sense. This one is sour, spicy, sweet and savor all rolled into one harmonized flavour. The piquant garlic and lime together with herbs will elevate your sense of taste into delicious mode. We ended the evening with three desserts starting with my all-time favorite Khao niew Ma-Muang (RM18) or Mango & Warm Sticky Rice. Dé Thai’s version is excellent with its lovely balance of sweetness tinged with salty notes in the warm glutinous rice. The sweet ripen mango with a drizzled of the coconut sauce when savored with the rice is a blissful and sweet ending to any Thai meal. Tub Tim Krob and Saku Cantaloupe faired decent, both coconut based desserts injected with bits and pieces of fruit, water chestnut and sago. For more information, call Dè Thai Restaurant at +603-7832 1174 or visit their website at www.dethai.com.my.